A calm and beautiful day, with scattered white clouds and light winds. Our progress is slow, but it is progress. We are learning that among their many other characteristics, good sailors must be patient. Morning began with a visit by more dolphins. They kept their distance from the ship though, so once again it was difficult to determine what type they were. Later in the morning, a lone Masked Booby circled the ship several times. We hoped it might decide to land on one of our yards and rest for awhile but it moved on. One has to marvel at the incredible distances these large and beautiful birds can fly. On quiet days such as this, when we can follow a single tack and the breeze is light, one appreciates more fully the majestic size of the Indian Ocean. The great writer and mariner Joseph Conrad once wrote that a ship at sea moves like a small and lonely planet. “Round her the abysses of sky and sea meet in an unattainable frontier. A great circular solitude moves with her, ever changing and ever the same.” Certainly long-distance sailors, ancient and modern, have experienced that occasionally overwhelming solitude of which Conrad wrote. By day our ship is reduced to insignificance by the immensity of the surrounding sea. 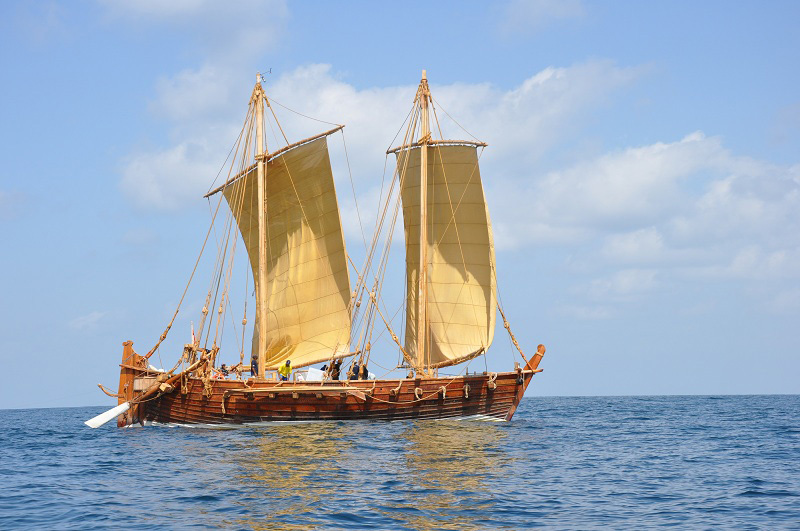 In an age of jet travel in which passengers complain if they arrive thirty minutes late after a flight half-way across the globe, sailing aboard the Jewel of Muscat returns the earth to its awesome and historical proportions. On our little planet-ship, we–like our 9th century predecessors–glide through the water taking comfort in the company of our crew-mates and dispelling some of the loneliness inherent in our circumstances with the realisation that our far-away loved ones are looking up in wonder at the same moon and stars which comfort and guide us on our journey.